The winter holiday season is one of the best times of the year, but it is arguably one of the most wasteful. As we online shop, cook big holiday meals, wrap presents and decorate our homes, Americans create about one million extra tons of waste – this equals about a 25 percent volume increase of household waste, all generated between Thanksgiving and New Year’s Day. But don’t let this ruin your holiday spirit! There are simple ways to “stay green” during the holidays while still maintaining the holiday cheer. Recycle creatively by using eclectic gift wrapping. Old newspapers, comic books, posters, and magazines can all be used to wrap presents. Also, save bows, ribbons, and bags for reuse next year. If Santa brings you new electronics, be sure to recycle the old ones. Because they can be a source of contamination, it is illegal to dispose of electronic waste in landfills in New Jersey, New York, and Connecticut. Most electronic retailers offer a free buy-back option. In New York City, the Department of Sanitation has established special waste drop-off locations in each of the five boroughs. In addition, e-cycleNYC is a free recycling collections service that can be solicited for buildings with ten or more units. Check local and state websites for other programs as well. Use LED lighting for all your holiday decorations. They use approximately 75 percent less energy and last longer than regular incandescent bulbs. 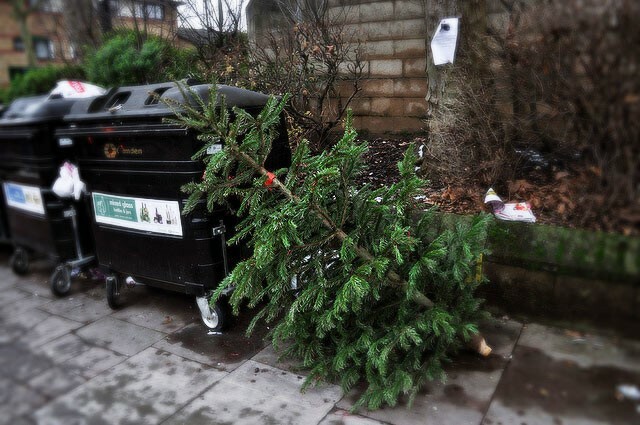 At the end of the season, don’t send your Christmas tree to the landfill where it contributes to dangerous methane gas emissions. Rather, replant, compost or mulch it! There are various programs available. NYC offers free curbside pickup for a couple weeks in January, and many cities in the metropolitan area have similar programs. On January 9-10 you can also bring your tree to designated NYC parks for MulchFest 2016. Finally, be the best host ever and hold a zero-waste event! When hosting holiday parties, use real glasses, dishes, utensils, and cloth napkins to minimize waste. And plan ahead for meals and parties. It’s not only economical, but it will reduce the amount of food thrown away. It’s possible to have a fun and happy holiday season while maintaining that “green” lifestyle you cultivate all year long. For these and more winter tips, check out EPA’s website.